1. 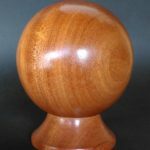 Mahogany ball newel cap, with mouldings. 1a. 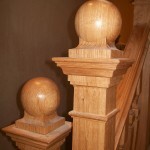 Customers photo of finished Ball newel cap, in situ. 3. 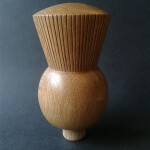 Custom made Thistle newel cap, in Scottish Oak. 4. 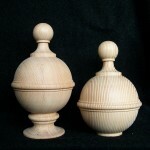 Newel caps in pitch pine. 6. 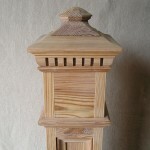 Newel post cap, for square section post, in reclaimed pitch pine. 7. 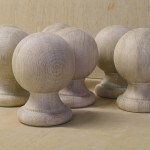 Oak ball newel caps, for Arts and Crafts Style house. 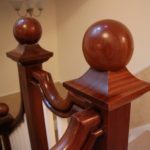 I can make replacement Newel Caps for your staircase. 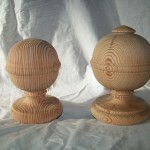 Perhaps they were removed by a DIY enthusiast in the past. Ask a neighbour if their newelposts are complete, take a photo and e-mail me the digital image, J-Peg preferably, and I will let you know how much, or little, it would cost for me to make a replacement for you. 8. 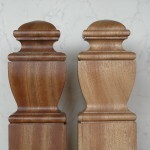 Newel post caps for square section posts, in Mahogany. 9. 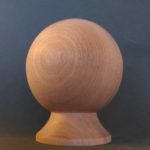 Mahogany newel cap, sanded ready to finish. 10. 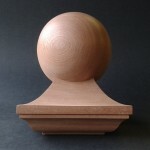 Mahogany newel cap, with a wax finish.